For a couple of years now the science of colours under water became my second hobby. The more you get into this fascinating topic the more you get captured! 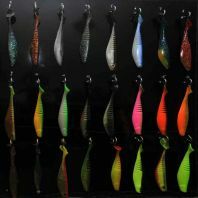 So it is no wonder that so many anglers occupy themselves with the different colours of lure. But some of you might think now: „Another one who tries to explain, oh no not again. “ Yes, but I promise you a lot of light bulb moments! Everything started a couple of years ago when I engaged myself with light absorption in distilled water. Many of you might have followed my considerations in some of my lectures. The single colours vanish with increasing depth according to the wave length of the light. The first to vanish is red followed by orange. Yellow, green and blue respectively violet respectively ultraviolet are the light waves with especially much energy. Because of this, these colours are able to penetrate the farthest into the depth respectively transverse through the water. Still it was very difficult for me to transfer this knowledge to angling and the use of different lure colours. For example why did the Bodden pikes bit that good early in the morning on fluo-pink, it didn't support the theory. 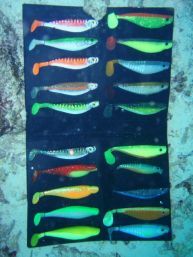 The fish bit on colours which form them should be very hard to see or not to see at all. 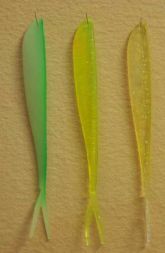 So I knew now that very often green and yellow lures “are good”. But I knew as well that blue respectively violet light is very energy-rich and because of that it permeates deep into clear water. Violet, ultra-violet light – there was something about it!? This light creates amazing effects with fluorescent colours. Suddenly the scales fell from my eyes. Seeming conflicts could be solved easily in the end: The fast vanishing red that fish nevertheless like to seize. The almost invisible orange that was so wonderfully successful. 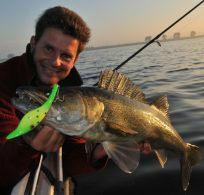 And the Bodden pikes that took the pink lure so frantically in the early morning. All these successful colours had one thing in common: Those were not normal colours, they were fluorescent! Up to now it seemed logical to use bright shocking lure in murky water to secure a certain visibility. But Motoroil? This inconsiderable colour in bright daylight lit up bright in the shine of my black-light lamp! It was the same with Japanese red – finally I could reveals the secrets of lure colours, at least a bit. Let’s have a closer look at the phenomenon of fluorescence briefly. Therefore you have to understand the character of light: For example only the blue wave length scale is reflected for a normal blue colour, all other light waves are absorbed by an object and are therefore invisible. If you illuminate a blue object with white light it looks the same as if you illuminate it with blue light. Fluorescence is a different extremely exciting colour phenomenon. If a fluorescent colour is illuminated by light electrons start to swing and the colour glows – but different. UVA light is invisible for us but lets the fluorescent colours illuminate in their true colours! The big difference between fluorescence and normal colours is the “glow effect”, which makes invisible light visible. Please don’t mix up this effect with phosphorescence. 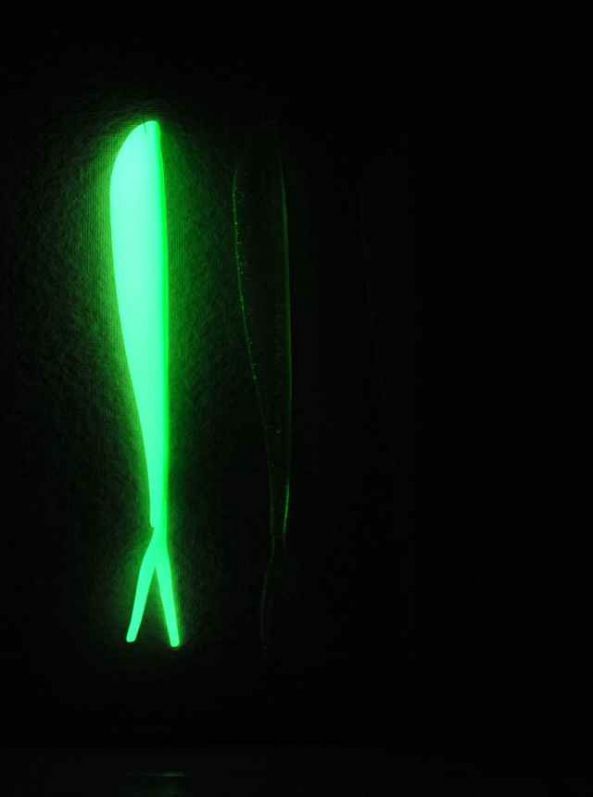 A phosphorescent lure glows longer, even after the source of light is gone. 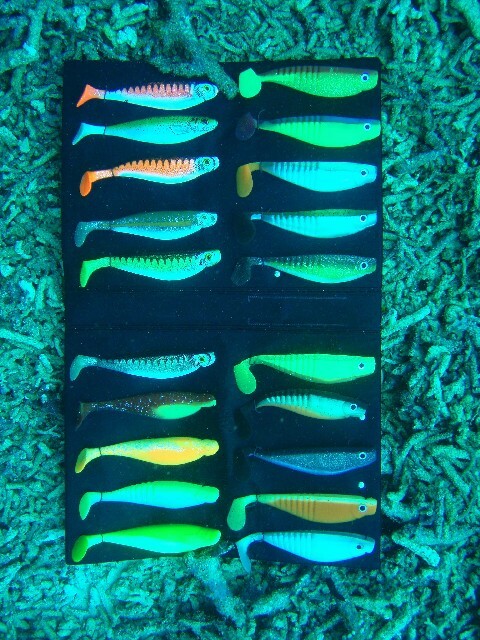 The lure luminesces. It saves the energy of light for a while. With fluorescence you cannot see the lure anymore after the source of light is gone! 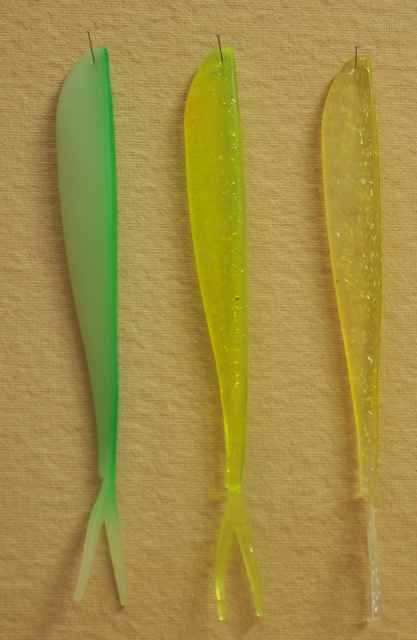 Here you can see the three lures in normal light. The actual colour is insignificant – more important is the physical effect with the different lights! … when the light is turned off only one lure still glows – the phosphorescent one! This can be too bright for many fish in fresh water, especially if it gets very dark in the deepness. Where UVA light permeates into the deepness, fluorescent colours are preferable! The harsh glow of the phosphorescent lure could as well be interpreted as a warning: If the glow is too unnatural it can scare off the fish! I made the best experiences with phosphorescence when most anglers won’t expect it at all: Bright sunshine and quite murky water! Fluorescent colours start to glow considerably brighter with UVA light. 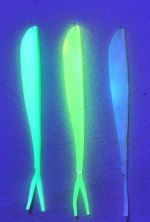 In the rather dark underwater world, especially in the twilight and in great depths, this characteristic makes a fluorescent lure especially catchy, because it shows off the background much more than any other lure. It produces more attention than other lures. At night all cats are grey so if one stands out in terms of colour which cat gets the most attention? I believe that fish preferably notice a striking lure as we would notice a colourful cat in between grey cats. 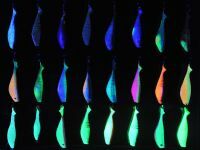 With an UVA lamp we can detect fluorescent colours easily and at the same time we can predetermine the optimal lure colour for our angling situation. Every water body has its own characteristic colour, many different water colours exist, deep blue or green or brownish. This characteristic water colour tells us which wave length scale is especially efficient to permeate the water and than we only need a fluorescent colour with a somewhat shorter wave length than the water colour. 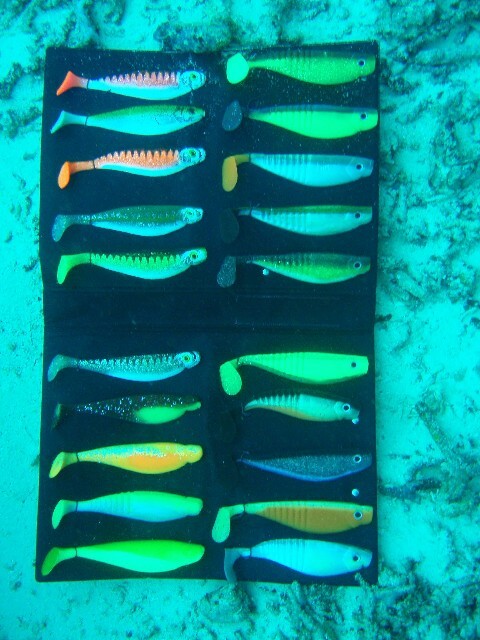 To show these effects again, I hung a lot of different rubber fish on a board. This photo shows the shads in normal light. Pay attention to the different red and orange colours. Bottom left is one of these secretive “Motoroil lures” which always catch very well in murky respectively dark waters funnily enough! 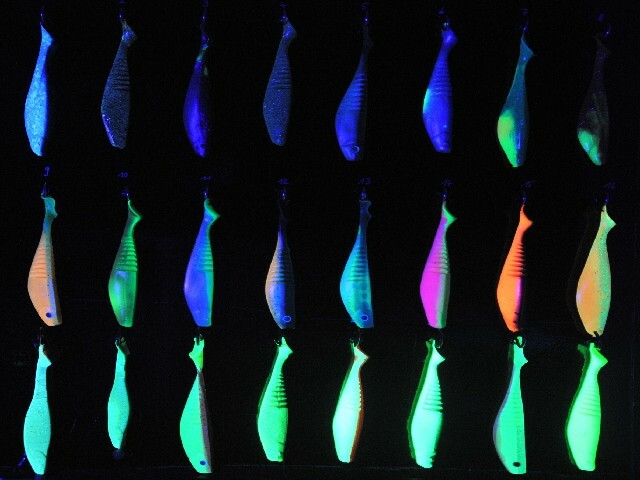 If you illuminate these lures with UVA light you get the explanation. You will recognize that I sorted the lures by lightness von top to bottom. At the top, glowing blue, you find the colours which work better in clear water respectively shallow water. Scaling down the lures are better for darkness and murky and deep waters. Regarding it like this the effects are actually logical – or not?!? 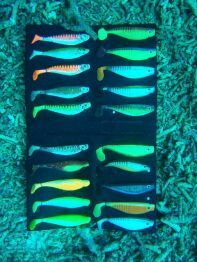 It doesn’t make sense to choose a fluorescent blue lure in a green-shimmering lake. Because then there is no appropriate light to let the lure glow. A fluorescent yellow lure in contrast will glow brighter than all other colours. If the water is more brownish a fluorescent orange is most likely the hit. And now we start to sense, why even an unnatural fluorescent pink can be a first class catcher. Fluorescent pink is at the end of the long-wave light range in our colour spectrum and is very often the only working colour because all light of shorter light waves will already be absorbed. The success proves that physics in water works! Here it was a big grub in fluorescent pink, which I like to use for pikes. Of course you can learn everything in theory but to realise effects is much more impressive. 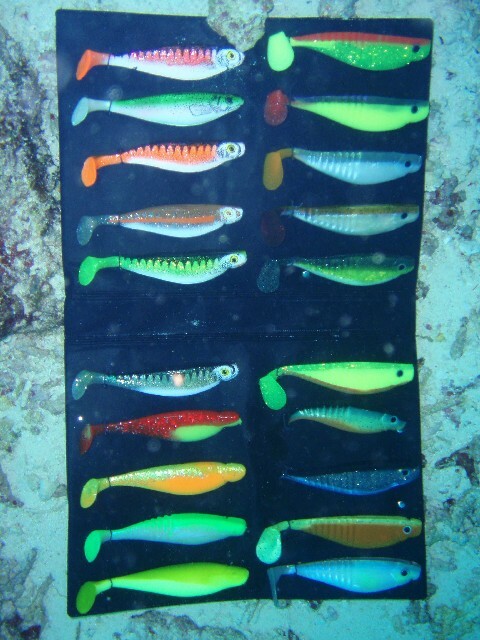 So I prepared a line-up of lures which I brought with me to Indonesia for a scuba dive holiday. 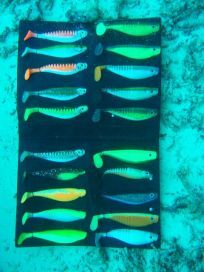 There people had a great laugh when I brought a folder with effective soft plastic lures with me on a scuba dive tour. But with a lot of UVA light this effect can swing to the other extreme. 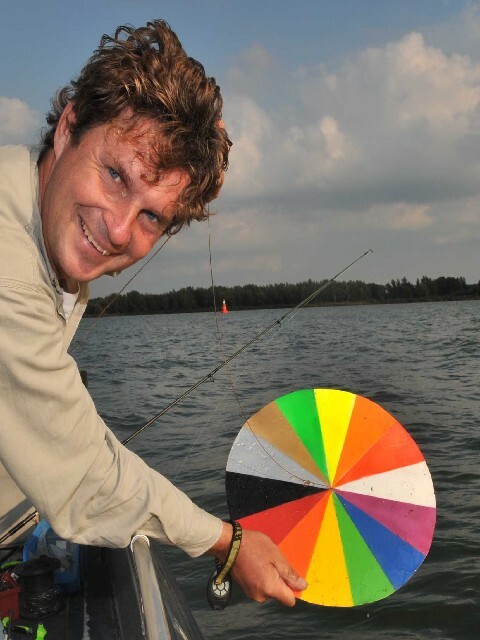 For example, when we fish for pikes in the Bodden in summer time we catch quite well with fluorescent pink early in the morning. Later on we catch more for a couple of hours with “fire yellow” and “Chartreuse glitter” (both fluorescent colours as well). Late morning these colours very often don’t work at all. Suddenly unobtrusive natural colours catch more and possibly dark shades of blue, depending on the water turbidity. Not only the clouds influence the vision of colours, the position of the sun and the wind have a considerable influence as well. 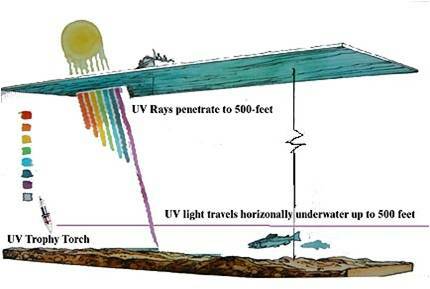 The more inclined the sunlight strikes the water surface, the more of its light is reflected directly from there. This results in getting darker in the depth. The windier it gets the more inclined light strikes the surface and is reflected. Every diver knows from diving in clear water: Without a torch everything underwater gets a shade of green or blue very quickly. 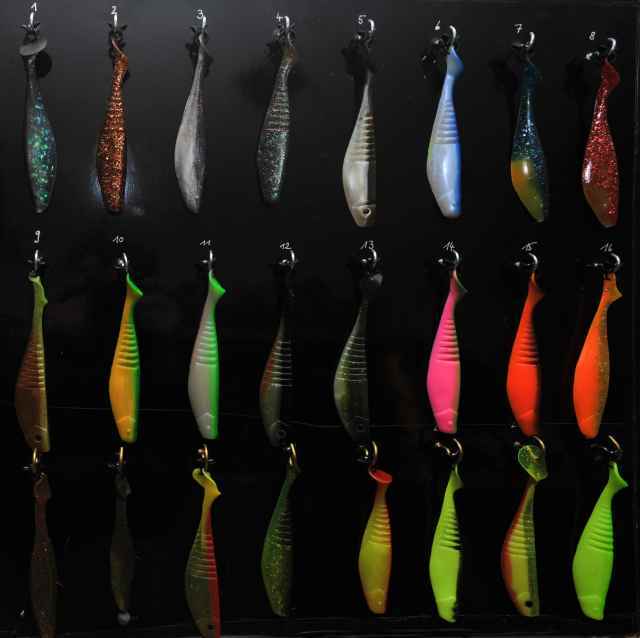 These are the best hints that these colours advance very well into greater depths and because of this as a lure colour they can be seen considerably better. 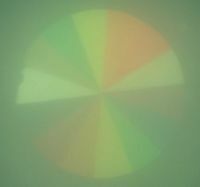 During the vision experiments in different depths the differences between fluorescent and normal colours are standing out. Fluorescent colours are still there in 30 meters, in contrary the normal shades of red and orange disappear very fast. First of all I took photos of my rubber line-up with a flash so that all colours can be seen perfectly. 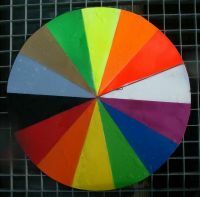 There are different shades of red, orange, yellow, green and blue. Then I dived – without foreign light. The changes of the colours were mind-blowing. 20 meters water depth! Diving into the depths of the see seems to do the same thing that drives a proper housewife mad doing the washing: the colours are fading extremely – some of them disappeared completely. Others however are still there! Some can be seen just a bit. Of course you can imagine the reason for that?!? Extremely exciting for me is the fact that many colours change to black or „light-colourless“, whereas some normal and all fluorescent colours almost don’t loose their appearance even in great distances. I repeated the experiment from the sea in fresh water, where visability is decided worse. Everything that happens in the depths of the see to the colours happens in fresh water different and in lesser depths. Almost always fresh water is considerably murky as sea water because of different suspended particles. With these particles the colour filter is stronger and the vision for predators is worse. Even more important: the colours don’t disappear in the same order as in the sea respectively distilled water. Depending on the combination of the suspended particles it can be completely different. In very clear water the colours disappear the same way they do in sea water: first the red colours then orange and then green, blue and violet. Responsible for the different penetrability of colours in fresh water are basically animalcules and algae swimming in the water – the so called phytoplankton and other suspended particles. 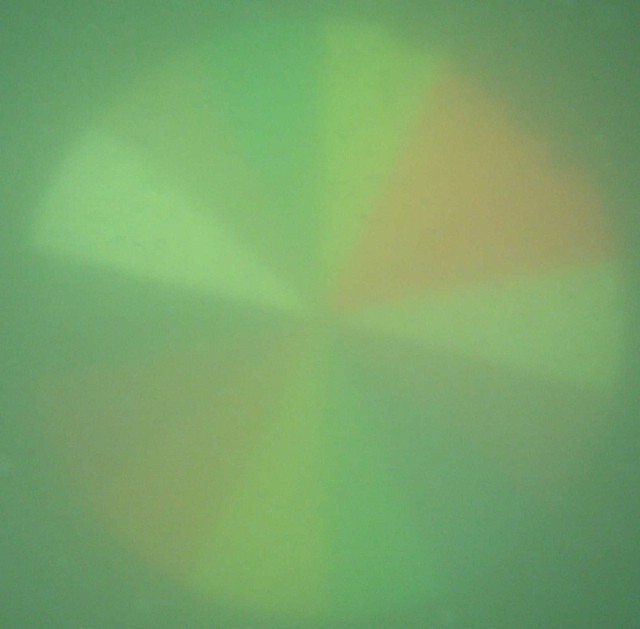 Because the water contains these particles a light filter effect occurs the same way as in photography with coloured filters, green filters or yellow filters, so that in general green and yellow penetrate deep into the water and not blue. This is true for the summertime when a lot of these organic particles are in the water. When they die different colours become more interesting: red, orange and so on. Therefore from autumn to May very often red respectively orange and pink are top colours, they catch extremely better than other colours. This is not because the predators don’t see the other colours but because they love the shades of red when they are visible! This pike bit on a fluorescent orange slottershad from Action Plastics. 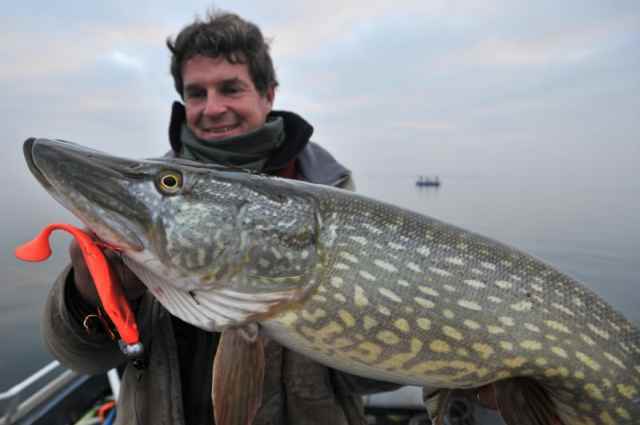 It was a sensation how much the pikes loved exactly this lure in December and many customers confirmed similar effects in colder water. At some stage there were extreme shortages with fluorescent orange salmo – sliders RT, the predators jumped at it. By the way the light is not only absorbed vertically but also horizontally. A red lure e.g. in one meter water depth is still visible as a red lure when I am straight in front of it, this changes when I withdraw. Red changes to auburn and finally to black. Some experts assume that this horizontal change of colours can frighten off some fish when they start attacking from afar. This is not proven so far and normally fresh water fish only see in short distances. It is hard to imagine but the cognition of a fish eye in our domestic waters can be only a few centimetres and is mostly less than 3 meters. Last but not least our fish are short-sighted and in the distance they don’t see clear. 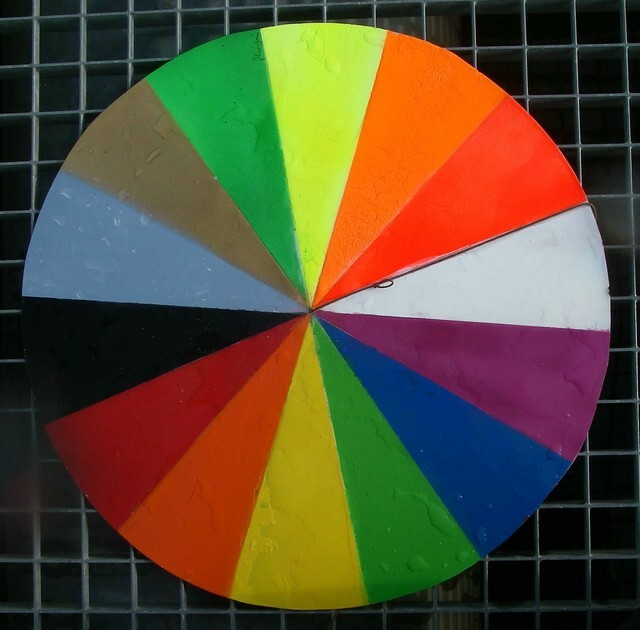 With the experiences from the sea I created a colour disc with slices in different normal and fluorescent colours. 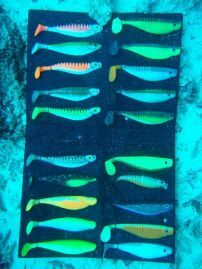 Before that we only measured the depth of vision by lowering a bright thing and then choose the colours of the lures. You get much more information by viewing the lowered colour disc. 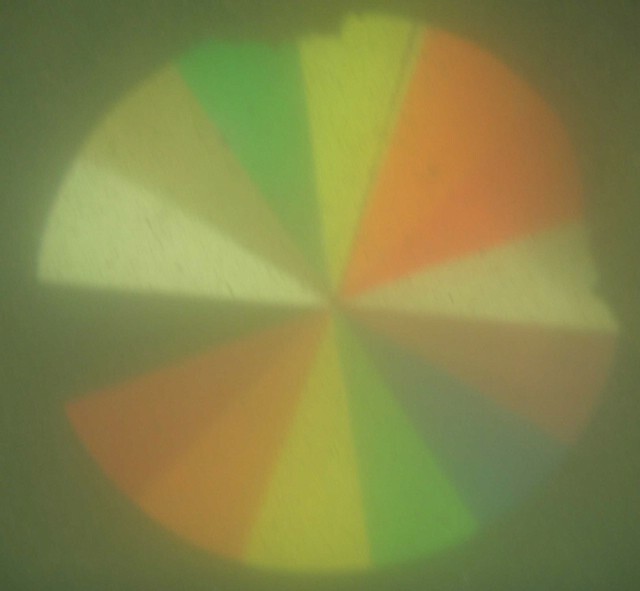 Very quickly it is possible to see which colours in the current light are visible. 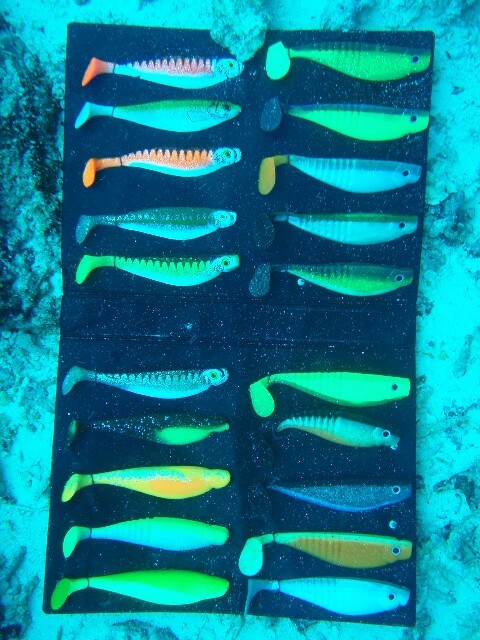 So it is much easer to choose the right colour of the lure. This is the disc OUT OF THE WATER! 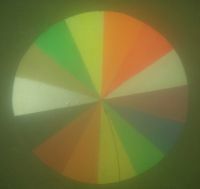 All colours are clearly visible – at the top part are the fluorescent colours and the normal colours are at the bottom. In between them are some standard colours like silver, gold, white and black. It is easy to see that the colours in the lake are more stable than in the river Ruhr! In one meter water depth there is only a little fading of colours to detect! In 3 meters water depth the fluorescent colours are still quite well to see. The normal red and orange colours are almost gone. 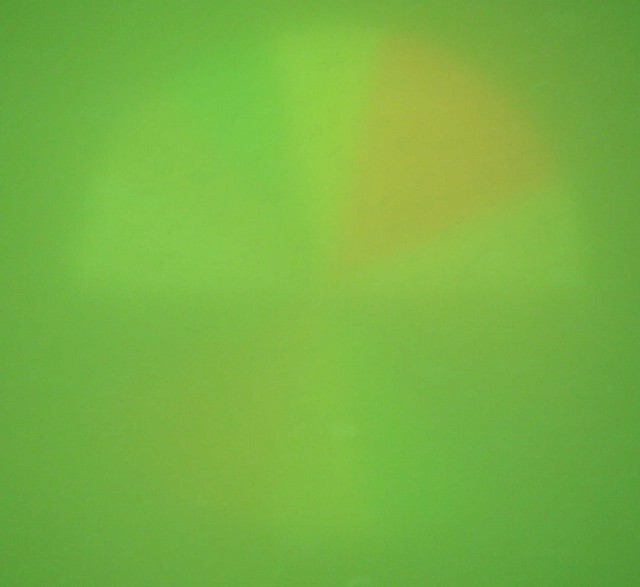 The normal yellow and green colours are still quite visible. Now amazing differences can be seen: The water was quite cool and that was obviously the reason that the fluorescent shades of red are still good to see. But the fluorescent green and yellow colours are as well visible against the background. Apart from that only silver and white are reasonably visible. 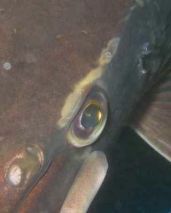 Fishery biologists have discovered that the eyes of fish are very similar to our eyes in some aspects. Most fish in shallow to moderate deep waters have an excellent ability to see colours, provided that their habitat is not permanent murky water. Only a few fish species with a very murky water habitat (e.g. the catfish) have a limited vision of colours. Predators in the sea have very good eyesight in the blue-green range, because in the sea these light colours have the best penetration. For the pike-perch it is more the green-yellow range where they have very good eyesight. But they react on all fluorescent colours extremely well. 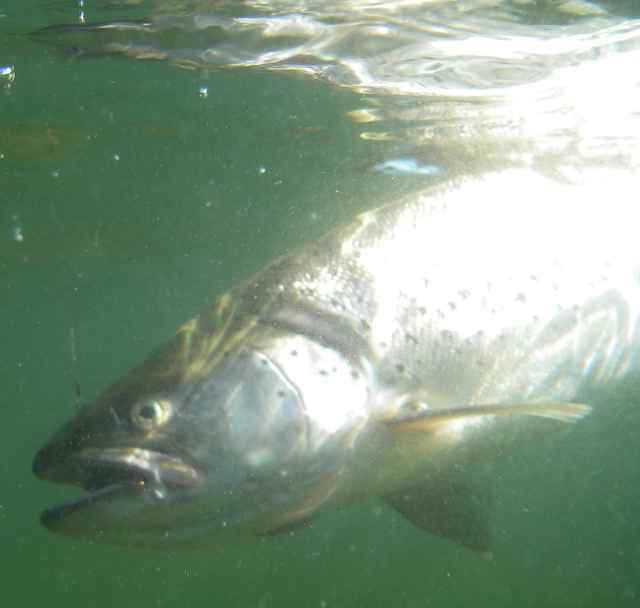 From salmon exist especially exciting insights, they see in sea water green and blue very well. 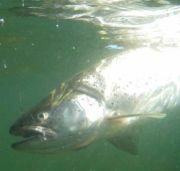 This ability changes however during the spawning run of salmon into the rivers. A couple of days after the change from sea water to fresh water a chemical process takes place in the eyes, the eyesight now is notably in the range of pink coloured lights. A possible reason is that now the spawning is more important for the fish than feeding. And many salmon have a demonstrative pink coloured “spawning frock”. That makes it comprehensible why these lure colours are so successful. The bites then are more out of aggression against rivals than out of hunger. 1. The clearer the water and the more light there is, the more you have to experiment with different colours. The fish and the absorption of light dictade what is good. Start with preferably very dark colours like violet, dark blue and black when there is a lot of light. 2. 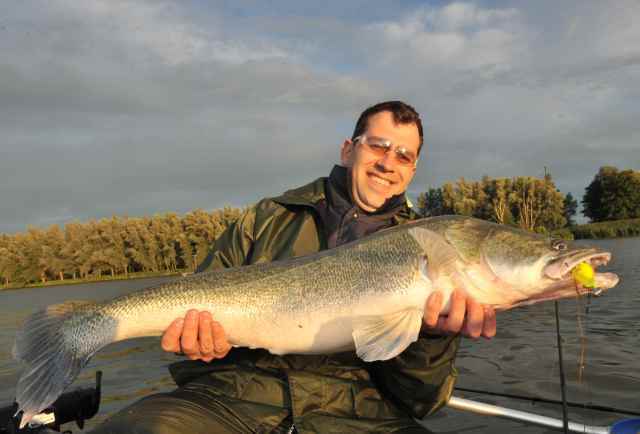 Natural colours, corresponding to the usual prey fish, are a good choice in shallow clear water. 3. The less light penetrates into the depth, the smaller is the choice of colours. Black, white, metallic effects and especially fluorescent colours are here recommendable. 4. Waters shimmer very often in certain colours (ocean blue, emerald green or brownish yellow). 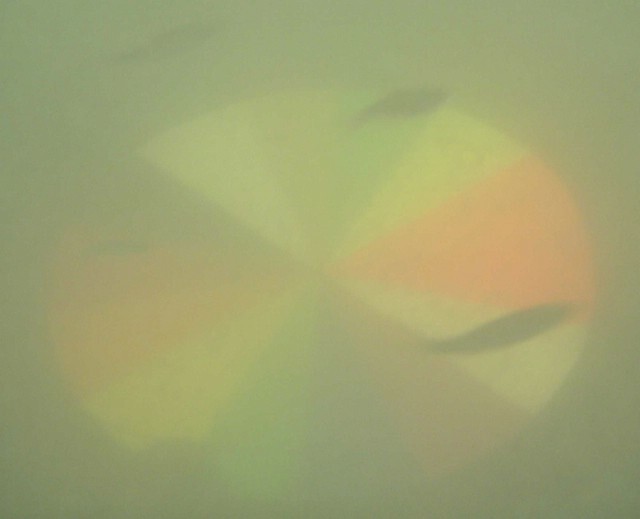 The reason for this are light waves, they move through the water and leave it filtered. The colour of the water is an indicator for which colours “return” from the depth. They can serve as a rough evidence for choosing the lure colours. Very often it is a good choice to take the same colour of the water for the colour of your lure because the light waves of these colours penetrate the water very well.